Flogging the Quill: Flogometer for Susan. Would you turn the page? Flogometer for Susan. Would you turn the page? How about a review of FtQ (the book)? 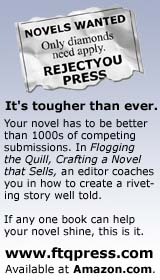 If you’ve read Flogging the Quill, Crafting a Novel that Sells, either with one you’ve purchased (thank you very much!) or an advance review copy, I’d appreciate your posting a review on Amazon.com. Just click here and scroll down to the Customer Review section—there’s a button on the right. Thanks in advance. The Chinese proverb, ai wu ji wu, literally means “love my house, love the crow on it.” My future father-in-law introduced this saying to me on my first visit to Hidden River, my fiancé’s hometown in central China, during Spring Festival in 1995, the year we got married. As the pungent, metallic smell of chicken blood wafted in from the kitchen, where Liu’s mother chopped away at the fresh carcass, I struggled to translate the proverb in my mind. Liu and I stood holding hands not far from the kitchen, just in front of the wooden beads and red silk flowers that hung from the top of the door frame of the middle bedroom. “Zhe shi nimen de woshi,” Liu’s father continued. He smiled until his eyes disappeared into his face, while he covered his mouth with one hand to hide his teeth. Liu’s dad pointed to the room and said that only Liu and I would sleep in it after we were married. I thought it very odd that this room—with the only air conditioner in the apartment—would be off limits to the rest of the family, even though we would never live there. But I kept my mouth shut because I didn’t want Liu or his parents to lose face, one of the biggest social faux pas you could commit in China. If I was good at one thing, it was saving face. Let me stress that I am no expert in memoires, and do not know what an agent or a publisher might be looking for. But I can tell you that I’m looking for two things. First, a sense of a story to come. The recounting of someone’s experiences is not necessarily a story. A story has dramatic tension created by people involved in events. After reading this first page, I had no particular sense of a story developing. Secondly, while I understand that a memoire is about your life, it also has to be about what your life (experiences/story) might mean to my life. Just as a good novel needs to contribute to my understanding of how to be a human being (in addition to entertainment), so, it seems to me, must a memoire. And be entertaining as well. As the pungent, metallic smell of chicken blood wafted in from the kitchen, where Liu’s mother chopped away at the a fresh carcass, I struggled to translate the proverb in my mind. Liu and I stood holding hands not far from the kitchen, just in front of the wooden beads and red silk flowers that hung from the top of the door frame of the middle bedroom. The Chinese proverb, ai wu ji wu, literally means “love my house, love the crow on it.” My future father-in-law said it to me when I met him in Hidden River, my fiancé’s hometown in central China. It was the 1995 Spring Festival. We were to be married soon, and I was eager to make a good impression. Just a thought. I know that a memoire is not a novel, but for this reader to read it, there has to be story value, and that has to be apparent from page one. Susan has rewritten this after a previous flogging, and this is a big improvement. I like the way she starts with a scene here, and lets us in on the character’s experience. Even if the memoire genre doesn’t require the two things I felt were lacking—story and application to my life—I feel this would be stronger if it had those elements. Keep at it, Susan, you’re making excellent progress.